“Der Flötenvirtuose Johann Joachim Quantz” (probably May 1741) by Johann Friedrich Gerhard. Original: Bayreuth, Neues Schloss, Musikzimmer. Johann Joachim Quantz (30 January 1697– 12 July 1773) was a German flutist, flute maker, flute teacher and composer. He was born in Oberscheden near Hannoversch Münden (Kurfürstentum Hannover) Germany, and died in Potsdam. His father, who was a blacksmith, died when Quantz was 10 years of age. Quantz began his musical studies in Merseburg. In 1716 Quantz went to Dresden. 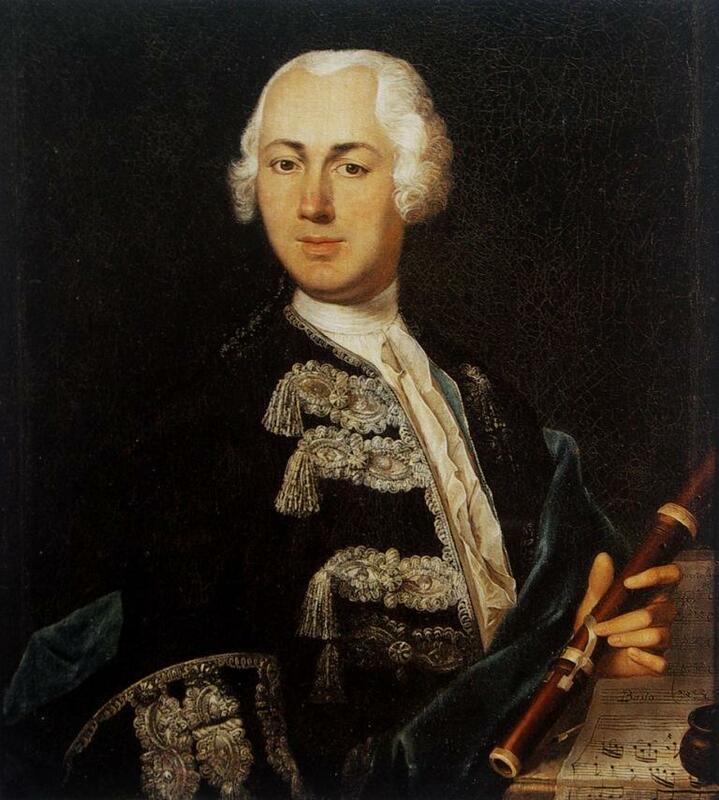 It was during his time as musician to Frederick Augustus II of Poland that he began to concentrate on the flute, performing more and more on the instrument. He gradually became known as the finest flutist in Europe. He made a journey through Italy, France, England and Holland and came in contact with many composers and musicians. Already in 1728 Quantz became the flute teacher of Frederick, the Crown Prince of Prussia. He became flute teacher, flute maker and composer to Frederick II of Prussia (Frederick the Great) in 1741 in Berlin. He was an innovator in flute design, adding keys to the instrument to help with intonation (playing in tune), for example. Many of Quantz’s approximately three hundred concertos and over two hundred other works for flute were composed for his royal pupil. His richly varied music combines lively Baroque counterpoint with elegant, expressive melodies. The concertos are based on the three movement scheme of the Italian concerto, which was made famous by Antonio Vivaldi. He is best known today as the author of “Versuch einer Anweisung die Flöte traversiere zu spielen” (1752), a treatise on flute playing. It is of great interest today as a source of information on performance practice and flute technique in the 18th century. In his flute treatise he propagates the “mixed taste”, a term Quantz probably invented himself. It’s a fusion of the best of Italian, French and German styles. Quantz even defined in his Versuch what he mentioned by “the best”. For Quantz, the appeal of Italian music lay in its sense of splendour, in its lively expression and vivacity, while French music offered purity and clarity, eloquence, the natural flow of the melodies and the many pleasing ideas, which mix excellently with the splendid and sublime paths followed by the Italian taste. Quantz is one of the most representatives of the Berlin school, together with Carl Philipp Emanuel Bach (1714-1788), Johann Gottlieb (1698-1771) and Carl Heinrich Graun (c.1703-1759), George Anton (1722-1795) and Franz Benda (1709-1786), Christoph Schaffrath (1709-1763), Johann Friedrich Agricola (1720-1774) and Johann Gottlieb Janitsch (1708-c.1763). Quantz died in Postdam in 1773 “in his seventyseventh year of a stroke … His exellent talent in composition, his felicitous efforts to perfect the flute, his moving way of playing it which he sustained up to the end of his life, make him immortal for all posterity … ” (Berlinische privilegierte Zeitung, No. 85, Saterday, 17 July 1773).